Watching circus performers, I did not think that unicycling is this hard. It looked like “they are simply pedaling and keeping the balance”. Well yes, just that! Fortunately I have read on the Internet that it may take 10-20 times longer than what it took for you to learn riding a bicycle. Sounds plausible. I have now practiced for maybe 10 hours, and can ride almost stable, but not yet always mount reliably. How much easier it is now when it takes just some clicks on the keyboard to find (say, on YouTube) visual instructions how to start riding. The first times were the most fun. 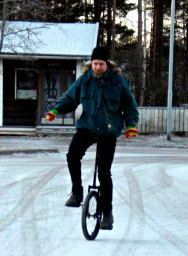 No better way than to try it; being so helpless in anything – the damn thing just does not ride a single meter!!! – then gradually making one pedal revolution… then sometimes more than one… words do not make for that. У него там высота сидения регулируется же, да?